Edward Houghton, Dean of the Division of Arts from 1992 to 2007, has been with UCSC since 1970. In 1962 he graduated from Rutgers University with high honors as a Henry Rutgers Scholar and Phi Beta Kappa. In 1971 he received a Ph.D. in Music at UC Berkeley where he was awarded the first Eisner Prize "for creative achievement of the highest order." From 1967 to 1970, he served as chairman of the Music Department at Rutgers University in Camden, New Jersey. He began his career at UCSC in 1970, serving as Professor of Music, as Acting Dean of the Arts (1992-93), and as Dean (1993-2007). 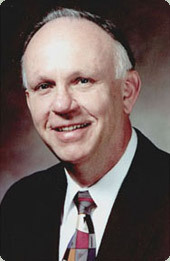 He served twice as the chair of the Department of Music, and was director of UC's Education Abroad Program in Padua, Italy, from 1976 through 1978. In 1987 he was asked to supervise the planning and construction of $32 million in new capital facilities for the arts (The Music Center, Media Theater, Experimental Theater, Art Studios), completed in 1998. Before becoming Dean, he regularly lectured on early music, taught counterpoint and conducting, and directed the University Chorus and Chamber Singers. The themes of his leadership have been the synergy of scholarship and practice, the richness of cultural diversity, the incorporation of new technology, and the planning and design of an outstanding center for the arts. In the master plan for the arts area (drafted in 2003), a pedestrian core links the existing facilities in art, theater arts, and music with a central plaza, bordered by a University Art Museum, the Digital Media Center, and a 1500-seat campus auditorium. The plan emphasizes creative interaction among master artists, emerging artists, students, and audiences. A scholar and performer of Renaissance music, he is presently collaborating with Prof. Herbert Kellman on A Critical Edition of the Chigi Codex to be published in Monuments of Renaissance Music by the University of Chicago Press, for which he has received two fellowships from the National Endowment for the Humanities. The Chigi Codex is an extraordinary manuscript and one of the most important sources of fifteenth-century polyphony, now in the Vatican Library in Rome. Current paper: Three Motets in the Chigi Codex (Med-Ren Conference, Utrecht, 2009): Powerpoint 2008 slides download link [ppsx] (70MB; integrated graphics and sound: download, save as, then open); Powerpoint 97-2004 slides download link [pps] (80MB). [Technical assistance by MobileCast Media].